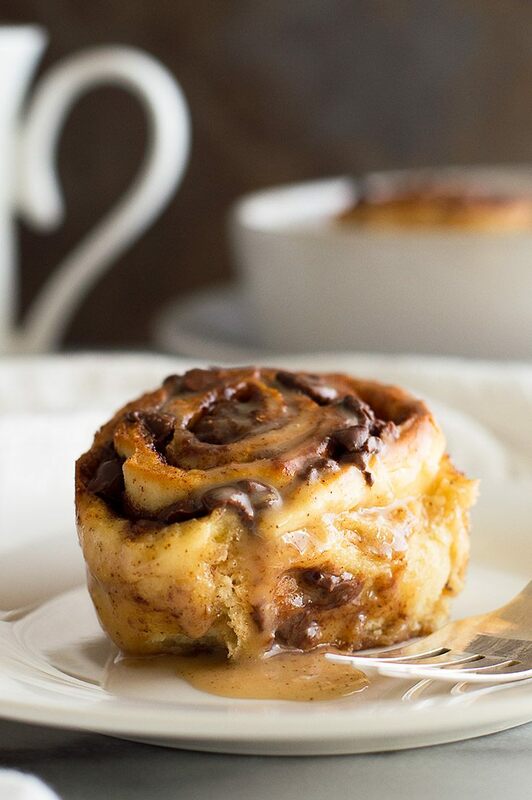 These easy Small-batch Chocolate Cinnamon Rolls with Espresso Glaze can be prepared the night before and then baked in the morning for a hot, chocolatey breakfast in bed. Last year around this time, I posted my Easy Overnight Cinnamon Rolls for Two. 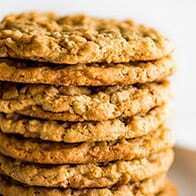 They were one of the first really popular recipes on the site, and are probably the sweet recipe I get the most positive feedback on (thank you to everyone who has tagged me on pictures of them on Instagram–I LOVE seeing them!!). Since they’ve been so well-loved, I wanted to do another version this year, but the truth is, those cinnamon rolls are basically my perfect sweet rolls. They are (by design) exactly what I want in a breakfast treat. How do you improve on that? Then it hit me, chocolate and coffee. The answer is always chocolate and coffee. 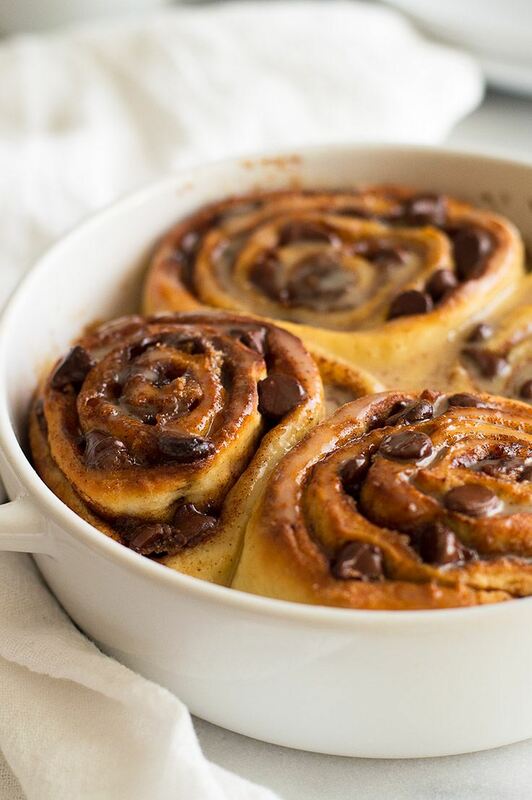 Please allow me to introduce you to my Small-batch Chocolate Cinnamon Rolls with Espresso Glaze. When I was testing these rolls, I wasn’t sure if I wanted to make them simple chocolate rolls or chocolate cinnamon rolls. 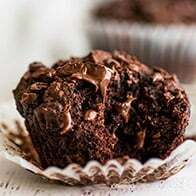 I made both versions, and while both were great, in the end, chocolate cinnamon won out because the spicy sweet of the cinnamon is so good with the richness of the chocolate. 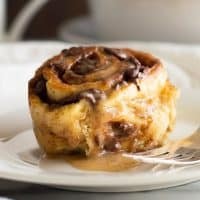 And I’m a big fan of cinnamon and coffee as a combo, so drizzling an espresso glaze over the top really brings all the flavors together for the most fabulous, decadent sweet roll breakfast you can imagine. And just a heads up, folks. If you don’t like SWEET and CHOCOLATE and GOOEY. This is not the breakfast/dessert for you. Might I suggest some lightly sweet Crêpes for Two or savory Breakfast Fried Rice? 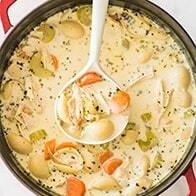 Or if you’re looking for a healthy option (what are you doing on this recipe!? 😉 ) a Naturally Sweet Green Smoothie might be just the thing. Still here? Great. I think you’re going to love these rolls. And hey, if you don’t like coffee, you can omit the espresso powder in the glaze and add a dash of vanilla for a vanilla version. And if you don’t think a cinnamon roll is a cinnamon roll worth eating without cream cheese frosting, you can totally mix and match the drop-dead amazing cream cheese frosting from my original cinnamon rolls. 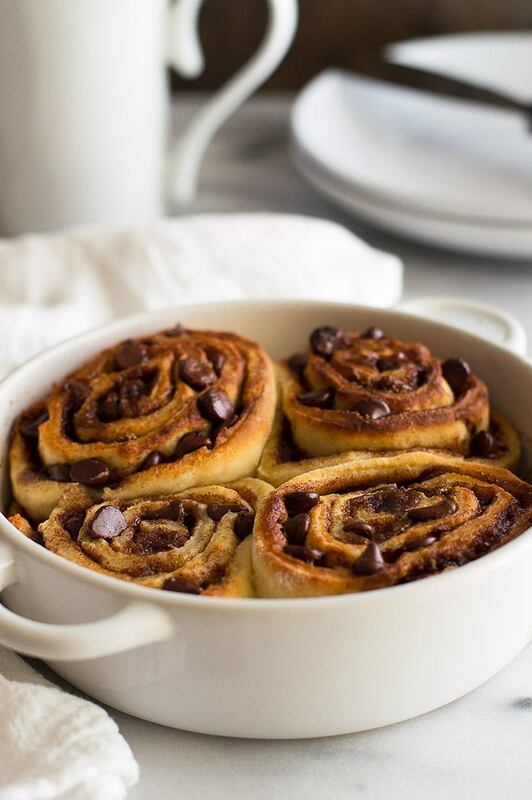 The base recipe for these rolls is the same as those original cinnamon rolls, so if you’ve made them before, this recipe will look very familiar. And if you haven’t, don’t worry. 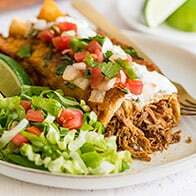 This is one of the easiest yeasted recipes you’ll find! As long as you have live yeast and a warm place to let your rolls rise, you’ll be just fine. And like the original rolls, these can be overnight cinnamon rolls or made all in one go. There are instructions in the recipe for both and it’s up to you. 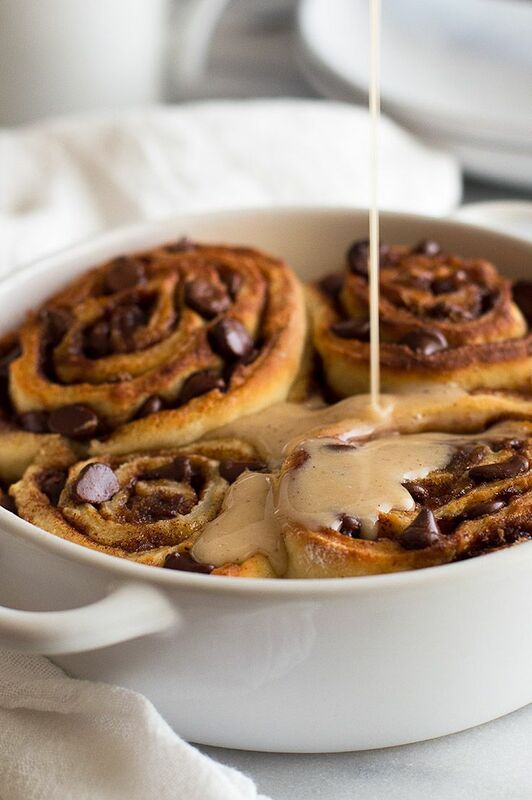 Small-batch Chocolate Cinnamon Rolls with Espresso Glaze can be prepared the night before and then baked in the morning for a hot, chocolatey breakfast for two. In a medium bowl, whisk together milk and yeast mixture, melted butter, sugar, egg yolk, and salt. Add the flour, a third at a time, and use a spoon to mix well, until a thick, sticky dough forms and all the flour is incorporated. Dump the mixture onto a well-floured work surface and knead just until the dough is no longer sticky and forms a ball (about 10 folds). Place dough into a greased bowl, cover with a towel, and allow to rise in a warm place for an hour, or until doubled in size. Lightly grease a 6 to 7-inch baking dish. Stir together brown sugar and cinnamon. Once your dough has risen, turn out on a lightly floured surface and squish and stretch it GENTLY (we don't want to rip it) into an oblong shape and then use a lightly floured rolling pin to roll the dough out to about 5 by 15 inches. Gently manipulate the corners and sides so you have a nice rectangle. Allow the rolls to complete their second rise in a warm place for 30 minutes. Preheat oven to 400°F. Cook rolls 12-15 minutes until the tops are golden and centers cooked through (cover with foil during the last few minutes of cooking time if browning too quickly). While your rolls bake, In a medium bowl, whisk together sifted powdered sugar, espresso, vanilla, and salt. Spoon glaze over warm rolls, serve, and enjoy. Overnight Rolls: Cover rolls tightly in plastic wrap, and place in the fridge overnight or up to 24 hours. Remove plastic wrap from rolls and place them into a cold oven. Turn your oven to 400 degrees and bake for 15-20 minutes until the tops are golden and center cooked through. Watch closely--they go from pale to over-done very quickly. If they begin to brown too quickly, before the centers are done, cover with foil until finished baking. *If your yeast and milk mixture does not foam, your yeast may be bad, or may have been killed if the milk was too hot. Toss and try again, making sure the milk is just lukewarm. *For best results, measure flour by weight or the Spoon and Sweep Method (spoon flour into your measuring cup, swipe excess off with the flat of a knife). LOL! 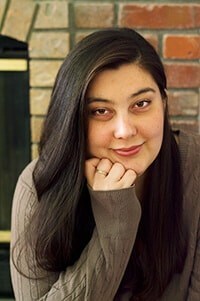 Thank you, Dawn!!! Have an awesome weekend! YES YES YES YES YES so much YES. In my household of two (humans at least) a small batch is always welcome. Is there any video for this one??? There’s not, but it’s on my list!